Humans left Africa sometime between 60,000 to 100,000 years ago. As they spread around the world they found it wasn’t empty. The Neanderthals had been living in Eurasia for hundreds of thousands of years longer. So of course, we mated with our new friends. Several times. 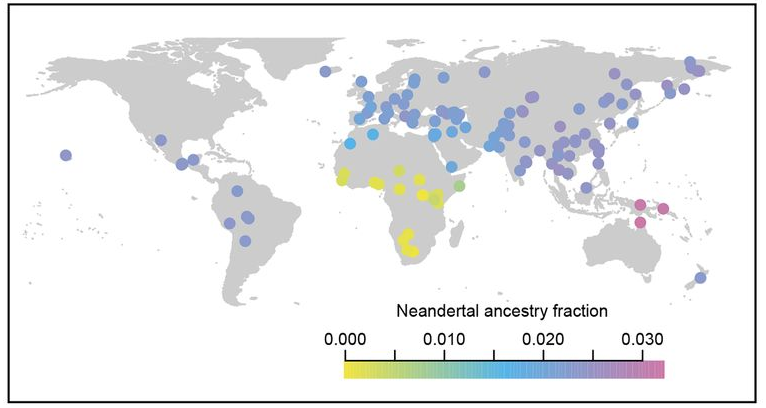 Now, all non-Africans have some Neanderthal genes in them. This creates a problem. See, the first complete Neanderthal genome we sequenced split from the Neanderthals we mated with at least 50,000 years prior. So when we compare this genome to our own to spot the Neanderthal genes, we’re missing out on generations of evolution. New Neanderthal genes could have arisen in the interim, passed into humans, and we’d be none the wiser. So scientists have sought out Neanderthals from closer to our relationship, studying any hidden Neanderthal genes we have. The results suggest that Neanderthals put 20% more genes in us than we ever thought. The first Neanderthal genome came from fossils from Vindija Cave in Croatia. A group of Neanderthals lived there around 44,000 years ago; leaving behind the fragments of at least 7 fossil individuals. Unfortunately, the genomes from these fossils were also fragmentary. However, geneticists were able to line up the end of one fragment with the start of another. Like redrawing a barcode from several sliced up, overlapping copies. This allowed them to sequence the first “full” Neanderthal genome, confirming there really was interbreeding between our species. According to the Vindija fragments, up to 2.7% of the non-African genome was Neanderthal in origin. Of course, it would be preferable to have a full genome from just one individual. Fortunately, a group of researchers found this in a Neanderthal toe from Denisova cave. Yes, that Denisova cave. This toe yielded the full Neanderthal genome from a single individual, shinning a more accurate light on the relationships between all our species. 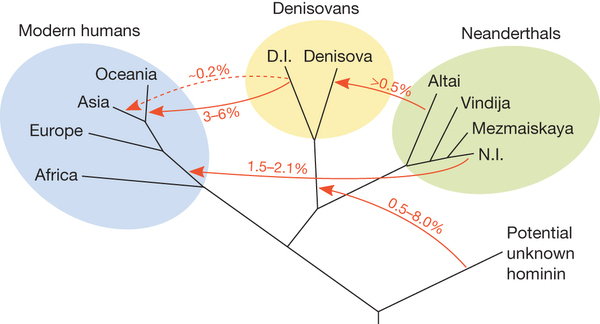 The family tree of Neanderthals, Denisovans and humans obtain from Denisova cave. Now, take a closer look at that family tree. You may spot the problem I talked about in the introduction. Namely that the Altai (Denisova) Neanderthal genome is far from the Neanderthals we actually mated with. In fact, it’s estimated they split from our eventual partner 145,000 years earlier! That’s generations of Neanderthal mutations we may have inherited but would be missing from this reference sample. To try and fix this problem, scientists returned to Vindija Cave. This time around they were able to get the entire Neanderthal genome from a single bone. In fact, they were able to squeeze out 30 copies of the genome from that one bone. These could be cross-referenced to make sure no errors snuck in. As the family tree shows, this new DNA was much more closely related to the branch of Neanderthals we mated with. Of course, they weren’t on the same branch, so the picture is still incomplete. However, calculations show they were around 45,000 years closer to our Neanderthal lovers than the Altai Neanderthals. As you might expect, it turns out that a lot had changed in this time. Several new mutations had cropped up in the Neanderthal lineage, many of which were also inherited by the group we mated with. This pushes up the amount of our genome that came from Neanderthals by 0.3 – 0.5%. This translate to a 10 – 20% increase in the amount of Neanderthal DNA we have. How much Neanderthal ancestry the Vindija DNA shows people have. The purpler the dot, the more Neanderthal there is in a group. Finding more Neanderthals closer to our interbreeding event may reveal even more DNA being passed down to modern populations. The result certainly seems to be true when you look at it from the other direction. Modern humans that lived shortly after the interbreeding have even more Neanderthal DNA. It’s all well and good talking about Neanderthal genes in percentages. But what does that actually mean for us? What do these Neanderthal genes actually do? Interestingly, it turns out that many of the “new” Neanderthal genes found in modern humans have had a negative impact. Which isn’t actually that unusual as many of the Neanderthal genes previously found are also harmful. This seems to be because humans and Neanderthals were very distantly related (splitting between 0.5 – 1 million years ago) and so our genomes just weren’t that compatible. A risk for schizophrenia and negative side-effects to antipsychotic medication. The build-up of harmful cholesterol, body fat and eating disorders (specifically purging). A risk factor for rheumatoid arthritis. It’s no small wonder evolution purged much of the Neanderthal genome from our body. It seems a shame that it hasn’t finished the job yet. Ahern, J.C., Karavanić, I., Paunović, M., Janković, I. and Smith, F.H., 2004. New discoveries and interpretations of hominid fossils and artifacts from Vindija Cave, Croatia. Journal of Human Evolution, 46(1), pp.27-67. Prüfer, K., Racimo, F., Patterson, N., Jay, F., Sankararaman, S., Sawyer, S., Heinze, A., Renaud, G., Sudmant, P.H., De Filippo, C. and Li, H., 2014. The complete genome sequence of a Neanderthal from the Altai Mountains. Nature, 505(7481), pp.43-49. Prüfer, K., de Filippo, C., Grote, S., Mafessoni, F., Korlević, P., Hajdinjak, M., Vernot, B., Skov, L., Hsieh, P., Peyrégne, S. and Reher, D., 2017. A high-coverage Neandertal genome from Vindija Cave in Croatia. Science, p.eaao1887. Maybe some of the remaining Neanderthal genes have benefits. Homo Sapiens – – Now with 20% more Neanderthal!